I have to say I'm confused. Wasn't the card "trimmed" from a uncut or miscut sheet? Isn't that OK? I remember Beckett (or another hobby mag) doing a whole segment on the best way to cut cards from an uncut sheet yourself. (can't remember if it was a Q&a or article) As long as the card isn't smaller than it "should" be, what's the problem? The Card was purchased by Mastro from a Lew Lipset auction who described in the lot description that the card "had over-sized borders and if one wanted to could be trimmed." The person who sold it to Mastro says it did come from an uncut strip, although no photo has been made public. A. I'm really... really... really hoping that PSA was duped. But it wouldn't surprise me if the were mixed up in this mess. B. 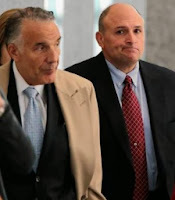 The photo of Mastro you used sort of makes me think he's a mob boss. C. I hope he gets punished to the full extent. Let's give this guy a pallet of 1988 Topps baseball cases and have him build hand collated sets until his fingers bleed. D. I wonder what Mr. Kendrick has to say about this. I just read the comments on your post. The wagner lipset sold to mastro is not the card. That one he sold to halper and its now at HOF. PSA has one goal - make money. Screw the collectors, screw the hobby, and if it means leaving the other cheats holding the bag - no problem. Admiting that the cornerstone of your business is made of sand would crumble the entire building. I, for one, would love to see the debris.